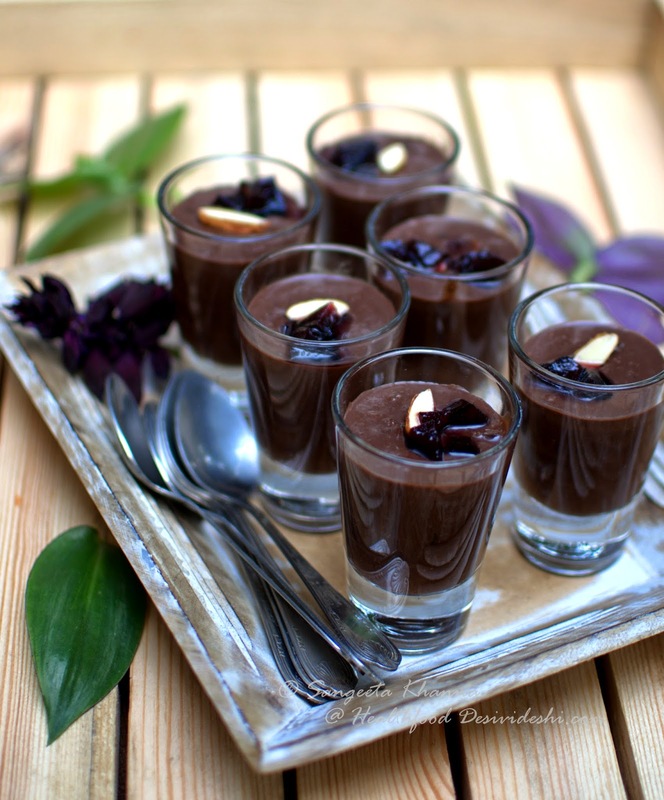 Chocolate puddings are made using eggs mostly, the egg less recipes use corn starch and one doesn't think much about using any other thickener for a pudding. Unless you have been experimenting in the kitchen like me. When you cook an ingredients in a 100 different ways you know what kind of cooking will result in what texture and what recipe will be benefited by the properties of the ingredient you discovered. Amaranth grains have been cooked like a porridge traditionally, some villagers in Uttarakhand told me they cook it with lentils too to make a quick meal. Only if they decide to cook their home grown amaranth, now a days they prefer selling it to urban folk for better prices and eat cheap wheat themselves. Sorry state of affairs, the quinoa story being repeated here again. I wrote about the villagers in Down to Earth magazine, read how they succumb to cheap 2 minute noodles. Amaranth is known as Rajgira, Ramdana or Chaulai in Hindi speaking states of India. The popular Ramdane ke laddu or vrat ke laddu is made with popped Amaranth and minimal amount of jaggery or sugar for binding. I Have mentioned earlier and am reiterating again, amaranth is the the best vegetarian source of proteins and good quality, easily digestible proteins. Great source of calcium and Iron, magnesium etc etc. The Vit E profile is similar to Olive oil. Impressive. 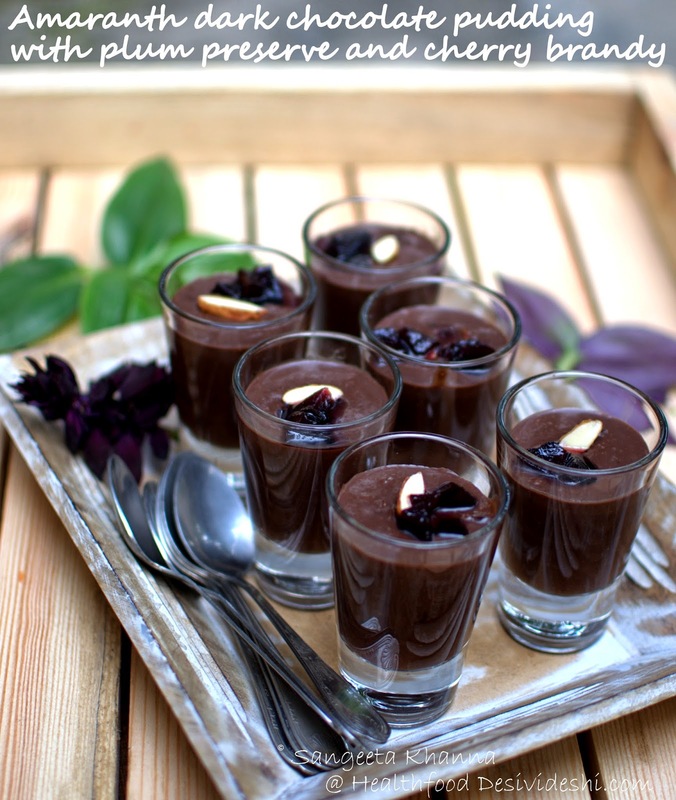 I made this rich pudding with amaranth grains and it is really really easy to make. In fact a biker friend of mine asked me if he can cook I told him to wait for the recipe. Anyone who can cook rice and daal, can cook this pudding. And it is egg less which is the concern of many people I see. Of late, I feel I don't like eggs in moist desserts as the hint of eggs in desserts kills it for me. Dark chocolate for me should be enriched with some fruit, some more vanilla or balsamic etc, otherwise I don't care about chocolate. Only hot chocolate really feels like chocolate. But I know you would differ if you are a chocolate lover. You can use strawberries instead of plum, or may be balsamic preserved cherries, add the cherry brandy if you don't mind, skip it if you do. But remember enriching the dark chocolate with some deep flavour if you are not a chocoholic. 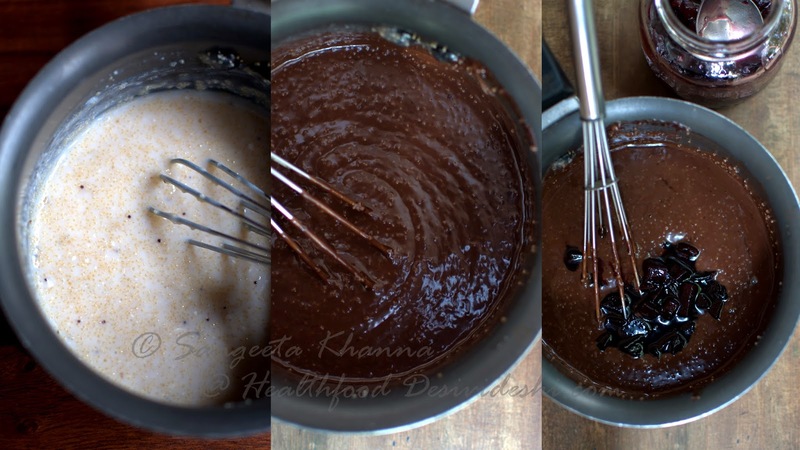 Some chocoholics I know want more and more depth in the flavours, so this recipe would work for them too. Just work around with what you like. Cook the soaked amaranth seeds with milk on a low flame for about 40 minutes. The milk reduces and the amaranth seeds get cooked nicely, resulting in a thick porridge like consistency. Take it off the stove. 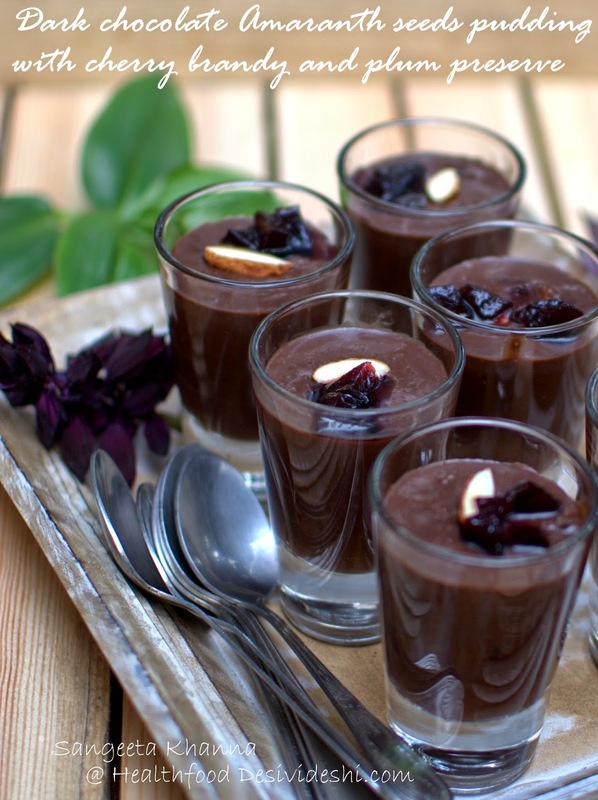 The consistency should be like a pudding as the mixture cools down. 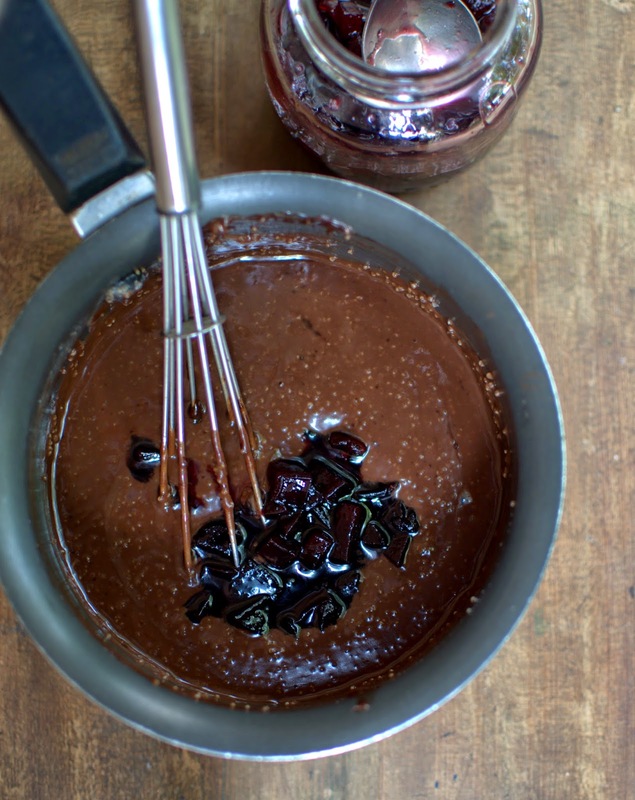 Add chopped dark chocolate into it and stir to dissolve. Add the plum preserve, taking care to not to include any syrup in the preserve and mix well. Add the sliced honey roasted almonds, saving a few for garnish, and mix well. Pour in shot glasses, garnish with sliced almonds and a few bits of plum preserve and refrigerate for a couple of hours before serving. * For the plum preserve, chop 3 large plums in small bits. Cook with 1/4 cup water, 3 tbsp sugar and 2 tbsp balsamic vinegar till the preserve gets cooked and thick consistency. Cool and use as required. The pudding has a light grainy texture, something like salmon roe bursting in your mouth but it feels good. Yes this pudding has a texture, not silken smooth but the texture feels good. 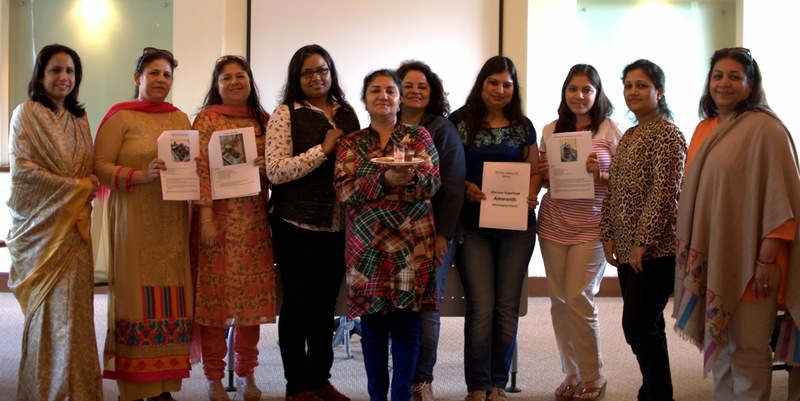 The recipe was tested and tried at The Palms town and country club where I conducted a workshop about amaranth being a super food, how to incorporate it in everyday meals and to buy and consume it responsibly. They were also served the strawberry yogurt parfait with popped amaranth and a savoury snack 'popped amaranth and potato cakes' and everything was much appreciated. The ladies found amaranth to be an easy grain to incorporate, asked questions about nutrition facts, better food choices and general tips and tricks. I am so glad they found the information useful and promised me to make better choices regarding everyday food. I am so glad I could make a small change. Then the old saying applies...The proof is in the pudding (smile). 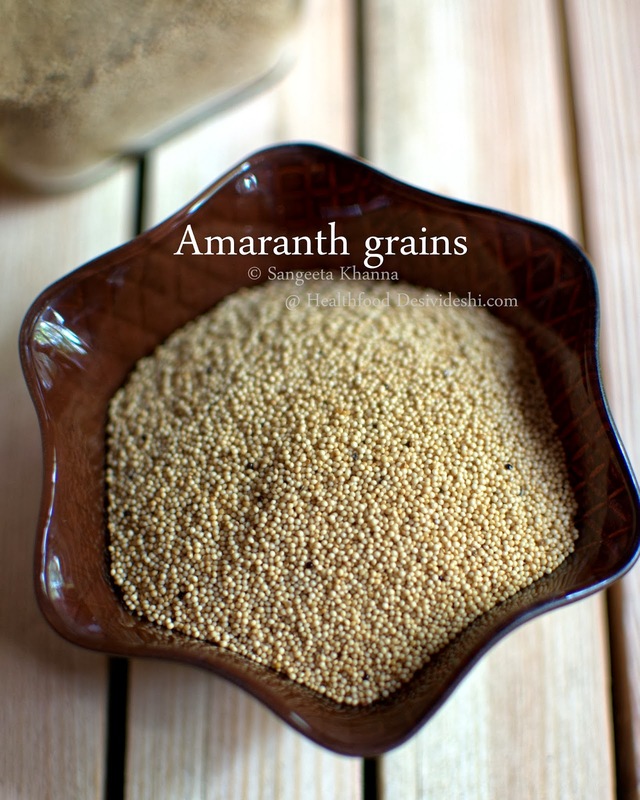 I am not familiar with amaranth grains but it appears interesting. I am not sure what the issue with eggs might be, but I enjoy them immensely and find it to be a good source of protein. The pudding looks delicious. Thanks for sharing it with us. 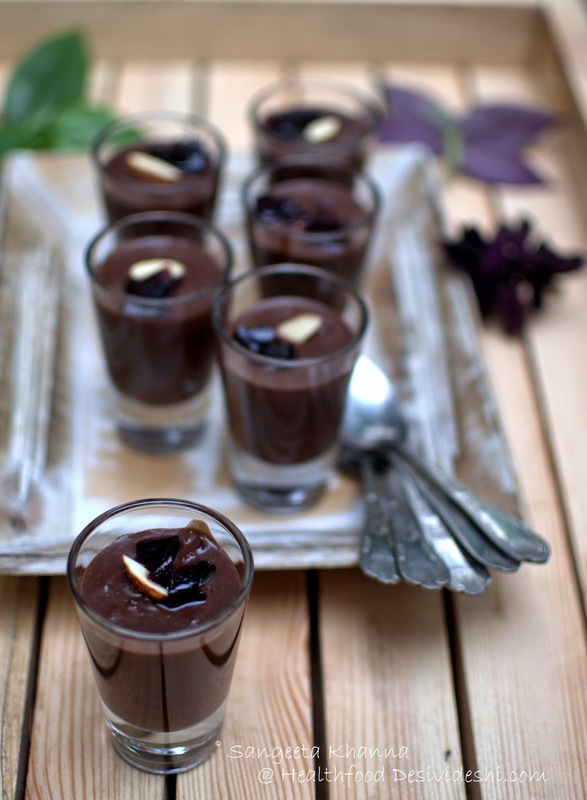 I'm always looking for new dessert recipes without eggs, and the fact that this one has amaranth - my current love - and dark chocolate is awesome! I have popped amaranth instead of raw amaranth seeds so I am guessing that I can use it without soaking it overnight ...also do you have recipes of any savouries using popped amaranth that I can make for my kids to have on the go? Not sure how popped amaranth would behave in this pudding. Please let me know when you try the recipe. 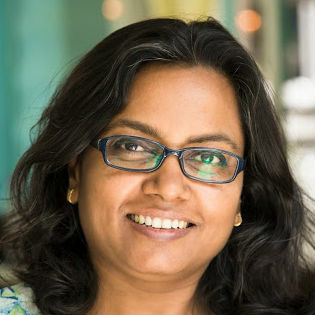 Sangeeta, i hope you don't mind me trying and posting so many your's recipe on my blog, but they all are so healthy and tempting that i can't resist. the pudding looks really good. i have not yet cooked amaranth. but have bookmarked this recipe. I made this recipe today...turned out really good..thanks! You can use any preserve you wish. Even orange marmalade will be nice Priya.